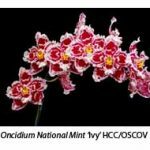 Odontoglossums are cool-growing orchids. Although a few of the 300-odd species in the genus are found at low altitudes, most grow at altitudes between 1500 and 3500 m in the Andes mountains in Colombia, Ecuador, Peru and Venezuela. Because temperatures are low and rainfall high in these regions, odontoglossums should be grown under cooler conditions than cattleyas, for example. Most odontoglossums in cultivation are of the ‘crispum’-type, being bred from Odontoglossum crispum, which lives in rain forest at altitudes of 2500-3500 m, where night temperatures fall to 5-6°C and day temperatures rise to about 16°C. 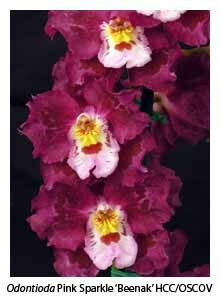 Odontoglossums do not experience a dry spell in nature, and their potting mix needs to be kept moist at all times. Some growers have trouble growing odontoglossums, probably because of their critical temperature requirements – the plants will suffer if temperatures regularly exceed 16°C. I grow my odontoglossums in the same glasshouse in which I keep my Australian hot/cold dendrobiums during winter. When the dendrobiums are transferred to the bush house for summer, I spray the roof on the western side of the glasshouse with limewater to reflect the heat of the afternoon sun, and to provide about 50% shade. Overhead sprays and misters are used frequently on hot days. 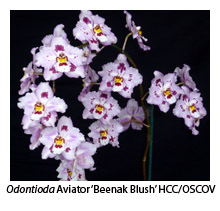 Odontoglossums can tolerate fairly bright light, and flower poorly if too heavily shaded so that their bulbs are bright green in colour. With sufficient light, some mature bulbs and leaves may take on a slight bronzy tint, which is ideal for flowering. I use composted pine bark (5-10 mm) as potting mix, which drains well. Then I top-dress the mix with a small amount of Sphagnum moss, which lets the mix ‘breathe’ but reduces the rate of evaporation from the bark, keeping the roots cool and moist. Although I recommend re­potting annually, in practice I often delay it for a second year. The best time for re-potting is just as the new bulbs begin to develop roots. Well-grown odontoglossums flower every ten months so, if you grow a number of them, you can have plants in flower throughout the year. 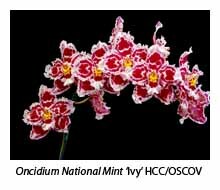 Odontoglossums are closely allied to oncidiums, with which they hybridise readily. 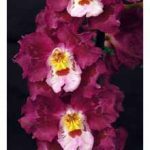 Odontoglossum x Oncidium gives an Odontocidium, Odontoglossum x Cochlioda gives an Odontioda, Odontoglossum x Miltonia gives an Odontoma and Odontoglossum x Brassia gives an Odontobrassia. Intergeneric hybrids like these grow well under the above conditions, usually giving colourful, well-shaped flowers on erect, self-supporting stems.